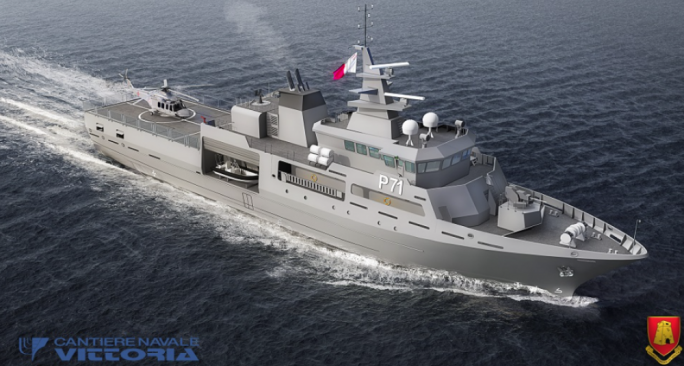 The Armed Forces of Malta will be taking delivery of a new offshore patrol vessel in the second half of 2020, according to AFM commander Brigadier Jeffrey Curmi. The new patrol vessel will have an overall length 74.8m and will be able to reach a maximum speed of more than 20 knots. Curmi was speaking at the signing of an agreement with Cantiere Navale Vittoria, the company that was awarded the contract for the ship’s construction. Plans for the AFM to invest in a new and more capable offshore patrol vessel was launched in 2015. Cantiere Navale Vittoria was awarded the contract on the 10 October, with construction planned to commence in the first quarter of this year. “The response of the shipbuilding industry was overwhelming. This Offshore Patrol Vessel had to have more endurance, better sea-keeping, and provide better living conditions for our crews,” Curmi said. The Commander of the Armed Forces of Malta highlighted the commitment of all the team involved in this project, together with the assistance of the Ministry for Home Affairs and National Security, the Ministry for Finance, the Ministry for European Affairs and Equality, the Department of Contracts, and the Funds and Programme Division. The contract was signed by Brigadier Jeffrey Curmi, and the President of Cantiere Navale Vittoria SpA, Luigi Duo.